In a multi-port memory system having a plurality of ports for data input and output, a plurality of memory banks, and a switching network for connecting each of the ports to each of the memory banks, the improvement wherein a page address is transferred over a data line of the switching network and is set, address computation is effected on the side of the memory banks, and the data are read out continuously from the plurality of ports and are written on the same page. The present invention relates to a multiport memory system which permits simultaneous, page-by-page accesses from a number of the same or different kinds of processors or disk systems (each including disk units and a disk controller). Conventional memory systems accessible from a plurality of processors cope with an access collision by means of time sharing or an arbiter. When the time sharing technique is utilized, the number of processors allowed to concurrently access the memory is only several at the most, owing to limited memory access time. In the case of employing the arbiter, only one of the processors competing for access is given acknowledgement at a time and the others are forced to wait their turn. Accordingly, an increase in the number of processors involved in the access conflict will cause a marked increase in the waiting time of each processor for its turn. As a solution to these problems, there has recently been introduced a multiport memory system which is adapted to be accessed page by page and allow the access thereto to start anywhere in the page so that it permits concurrent accesses from a number of processors without forcing them to wait their turn (Yuzuru Tanaka, "A Multiport Page-Memory Architecture and a Multiport Disk-Cache System", New Generation Computing, Vol. 2, No. 3, pp. 241-260, 1984). However, the above article makes no reference to an addressing method. Moreover, the system is defective in that an increase in the number of processors increases the width of connection bus, introducing difficulty in packaging, and in that pipeline processing for making up for a delay resulting from the use of a multi-stage switching network is complex, raising the cost of the entire system. It is therefore an object of the present invention to provide a simple and economical multiport memory system which overcomes the defects of the conventional memory systems accessible from a plurality of processors and which permits simultaneous accesses from a certain number (dozens) of input/output (I/O) ports and enables them to read and write the same page after a sufficiently short waiting time. According to the present invention there is provided a multiport memory system which has a plurality of data input/output ports, a plurality of memory banks, and a switching network for connecting the ports and the memory banks and in which pages are each stored across all the memory banks and an address is specified page by page from each input/output port, characterised in that the page address is transferred and set by way of a data line of the switching network and the address is calculated in each memory bank, and in that each memory bank has a shift register for rotating the switching of the switching network to transfer the page address between the memory banks in synchronization with the switching of the ports and for transporting the address to the next memory bank, a latch for fixing the page address during the shift operation of the shift register, and a counter for incrementing the page address by one during its transportation. As shown in Figure 1, a multiport memory system of the present invention comprises M data input/output ports P₀ to PM-1, N memory banks MB₀ to MBN-1, N being an integral multiple of the above-mentioned number M, a switching network SN for interconnecting the ports and the memory banks, and a controller CNT for the switching network, and stores each page across all the memory banks. A connection bus includes input and output data buses and several control lines. Each port transfers the address of a page to be accessed to the memory bank side via the input data bus. On the memory bank side the address in the page is incremented and data is input and output in synchronization with each other, thereby enabling a plurality of ports to access even the same page for reading out therefrom and writing therein continuous data. For a simple and economical system configuration, the switching network SN may preferably be small in delay and easy to construct. The switching network can be constituted by, for example, PLAs(Programmable Logic Arrays) and counters through utilization of a bit-sliced connection bus. In order to avoid the re-setting of the page address from the port side upon each switching of the connections between the ports and the memory banks MB₀ to MBN-1 through the switching network SN, it is necessary that the page address corresponding to each port provided in each of the memory banks MB₀ to MBN-1 be transported to the memory bank being switched to the port. To this end, the switching network SN is switched one by one to the right or left, and in synchronization with this, the page address is transported to the next memory bank in the direction of switching of the switching network SN. It is preferable, in this instance, to employ a shift register for setting and transporting the page address and to provide each memory bank with a latch for fixing the page address during the shift operation of the shift register so that the shift operation and the memory access can be effected at the same time, and a counter for incrementing the address in the page one by one for memory access use. Moreover, a development of the present invention includes an arrangement in which one page is divided into several blocks and memories for each block are accessed by, for example, one rotation of switching of all the memory banks. The reason for which the block unit is introduced will be described in detail later on. Furthermore, an embodiment of the present invention may provide a multiport memory system in which a buffer is provided between the switching network and each port and it is provided with an address calculation adder whereby the address in the page which is transferred between the switching network and each port is calculated from the sum of the value of a counter for switching the network and the number of each port, thereby enabling the access to start independently of the connection between the memory banks and the ports. the number of bits for indicating the bank memory to which an access is started. Now, a description will be given of the reason for which the block unit is introduced in addition to the page. In the above, α is the time interval necessary for setting the page address from the port side. data of that block. To perform this, it is desirable to provide a buffer between the switching network and each port and calculate the address in the buffer to be accessed from the switching network on the basis of the sum of the value of a counter for switching the switching network and the value of the number of the port. It is necessary that addresses in the block be synchronized between the memory bank side and the buffer side. Next, a description will be given of a problem in packaging the multiport memory system of the present invention. A large width of connection bus causes difficulty in packaging, but in the present invention, since the page address is transported and set through use of the data line of the switching network and the address in the page is incremented on the memory bank side, the width of connection bus can be made smaller than in the prior art and the packaging of the system is less difficult. In addition, the system of the present invention is economical. The present invention will hereinbelow be described in detail in connection with its embodiments. Fig. 1 is a block diagram illustrating the general arrangement of the multiport memory system of the present invention; Fig. 2 is a block diagram of the principal part of an embodiment of the present invention; Fig. 3 is a block diagram showing in more detail the internal arrangement of one memory bank in Figs. 1 and 2; Fig. 4 is a diagram showing how the entire memory of the system in Figs. 1 and 2 and in Table 1 is divided; Fig. 5 is a timing chart of processing of the system shown in Figs. 2 and 3; Fig. 6 is a diagram showing an access from each port at the time t = j; Fig. 7 is a diagram showing an access from each port at the time t = j + 1; Figs. 8 and 9 are wiring diagrams of a 4 × 4 switching network formed by PLAs, showing data lines for one bit of data which each port writes in and reads out of the memory bank side; and Fig. 10 is a more detailed block diagram of a port buffer in Fig. 2. Fig. 2 illustrates in block form the principal part of an embodiment of the present invention. Reference characters P₀, P₁, ... P₁₅ indicate 16 data input/output ports, PB₀, PB₁, ... PB₁₅ port buffers, each including a controller C and a buffer memory Bm, MB₀ to MB₁₅ 16 memory banks, SN a 16 × 16 switching network, and CNT a hexadecimal counter. Connection buses B₁ and B₂ each have a width of a total of 24 bits, one byte and one parity bit for write use, 9 bits for readout use, and 6 bits for control use. The switching network SN is switched clockwise in synchronization with a system clock φ, so that the hexadecimal counter CNT is employed therefore. The following Table 1 shows the values of the hexadecimal counter CNT and the connections between the ports and the memory banks. In Table 1, P₀ through P₁₅ represent the numbers of the ports and MB₀ through MB₁₅ the numbers of the memory banks. Each memory bank transports the address to the memory bank on the right side (to the leftmost memory bank, in the case of the rightmost memory bank) in synchronization with the switching of the switching network SN. To perform this, a one-bit data line B₃ is used for interconnecting shift registers (each included in an address calculating section CS of each memory bank) and the memory banks MB₀ to MB₁₅. A more detailed description will hereinafter be given of the arrangement of each memory bank. Fig. 3 is a block diagram illustrating in detail one of the memory banks MB₀ to MB₁₅ in Fig. 2. Fig. 4 shows how the entire memory is divided in this embodiment. In this embodiment the total memory capacity of the memory system is 256 megabytes, the size of one page is 4K bytes, and the size of one block is 512 bytes, as shown in Fig. 4. With respect to the size of one block, when the number of memory banks used is 16, since the transfer of the block size for each memory bank overlaps the time for transporting the address by the shift register and for setting the address from the ports P₀ through P₁₅ and is accessible, the block of one bank is selected 32 bytes long, and so one block is 512 bytes (= 32 × 16) long. Further, by selecting the size of one page to be 4K bytes the total memory capacity becomes 64K pages, and two bytes are needed for page addressing. The memory capacity of one memory bank is 16 megabytes, dividing 256 megabytes by 16. In Fig. 3, reference character M identifies a memory having a memory capacity of 16 megabytes (= 8 bits × 16 mega), S₈₋₁ and S₈₋₂ a combination shift registers/counters respectively having 8 high- and low-order bits of the page address, S₃ a combination 3-bit shift register/counter for counting eight blocks forming one page, and C₅ a scale-of-32 counter for counting 32 bytes forming one block. In order that page addresses from the combination shift registers/counters S₈₋₁ and S₈₋₂ and the block address of the combination shift register/counter S₃ may be transported to the memory bank on the right side in synchronization with the switching of the switching network, the combination shift registers/counters S₈₋₁ and S₈₋₂ need to have an 8-bit parallel input for setting the page address and a 1-bit serial input/output for indicating the address to the memory, in addition to an 8-bit parallel output. Similarly, the combination shift register/counter S₃ must also be provided with a 3-bit parallel output and a 1-bit serial input/output. The combination shift register/counter S₃ has to be reset at the moment when the page address is set, because of the prerequisite conditions that the port side specifies the address on a pagewise basis and that the access starts at the top of the page. Furthermore, since it is necessary that after one cycle of scanning all the memory banks the process proceed to the next block, a 4-bit combination shift register/counter S₄ for counting 16 blocks is prepared and its carry is input into the combination shift register/counter S₃. Incidentally, in the case where the buffer between each port and the switching network is left out and it is assumed that the access always starts from the memory bank MB₀, the combination shift register/counter S₄ can be omitted. In such a case, the combination shift register/counter S₃ is incremented by one in the memory bank MB₀. Moreover, in order to permit an access to an area spanning pages without the necessity of re-setting the page each time, it is desirable to input carries from the combination shift registers/counters S₃ and S₈₋₂ into the combination shift register/counter S₈₋₁. Eight-bit latches L₈₋₁ and L₈₋₂ for the page address and a 3-bit latch L₃ for the block address are employed for fixing the page address and the block address so as to transport them to the next memory bank and to permit an overlap memory access. Further, a 5-bit, that is, a scale-of-32 counter C₅ is provided for incrementing the address one by one in one block. The page address and the block address must be transported to the next memory bank during an access to the 32 bytes, or another page address and another block address must be set from the port side. Data and addresses are transferred between the ports via two 9-bit (8 bits and 1 parity bit) unilateral buses 21 and 22. A parity check and the addition of the parity bit are performed at the entry and exit of each memory bank, as indicated by PC and PA in Fig. 3. The timing and enable of write and read are analyzed in a memory bank controller MBC in Fig. 3 through use of the system clock φ and a control signal from each port, and control signals are sent to the counters, the latches, and the memories. Fig. 5 is a timing chart of the multiport memory system in Figs. 2 and 3. 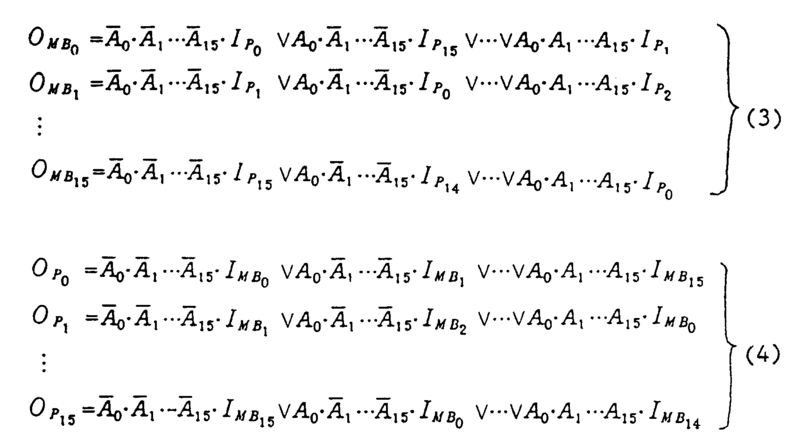 The addresses of the memory banks are specified, as indicated by A₀, A₁, A₂, A₃, A₄, ... in Fig. 5, and the memory banks are accessed from the respective ports in synchronization with the system clock φ. In order to transport the page address and the block address to the next memory bank concurrently with the memory access, the addresses of the combination shift registers/counters S₈₋₁, S₈₋₂ and S₃ are set in the latches L₈₋₁, L₈₋₂ and L₃ and a total of 23 bits including 16 bits for the page address, 3 bits for the block address and 4 bits for a bank count are transported bit by bit to the next memory bank on the right side in synchronization with a shift clock φs prior to the transport of the page address and the block address. In this instance, if all the ports start the memory access at the memory bank MB₀, as referred to previously, the four bits for the bank count will be unnecessary. Otherwise, it is necessary that a counter for bank count use be counted up by one at the timing of counting-up of the counter S₄. In this case, the counter S₄ must be reset at the moment of setting the page address. The period in which the page address can be set from the port side is the interval to the start of shifting of the address after the termination of the counting-up of the counter S₄. The timing of address-set-enable AE in Fig. 5 indicates the above interval. The switching network must also be switched in synchronization with the system clock φ and it may preferably be switched simultaneously with the setting of the address in the latch. The timing of network switching NSW in Fig. 5 shows this switching timing. Fig. 6 shows the state in which the multiport memory system of the present invention is accessed from four input/output output ports at a certain point of time (t = j) and Fig. 7 accesses from the ports at a point of time (t = j + 1) when the switching network is switched next. By expanding the formulae (1) and (2), as they are, to 16 bits for the input, 16 bits for the output, and 4 bits for the output of the connection switching hexadecimal counter, the connections of the ports and the memory banks shown in Fig. 2 can be realized on the both sides. By applying the following equations (3) and (4) thus expanded to 16 × 16 programmable logic arrays and using 24 such programmable logic arrays (corresponding in number to the bus width) in parallel, it is possible to obtain a small and economical switching network for the multiport memory system depicted in Fig. 2. Fig. 10 is a block diagram illustrating in detail the port buffer PBi in Fig. 2. The port buffer is provided for improving the overall efficiency of write and read. In the case of writing a certain page, if the write is effected in the memory bank MBi connected via the switching network SN, starting at the top of the page, it is difficult to detect the beginning of the page at the time of readout, introducing difficulty in the access to the page. To avoid this, it is desirable to predetermine that the page always starts at a specific memory bank, for example, the memory bank MB₀. However, it is inefficient to defer the write until the port concerned is connected to the memory bank MB₀ by the switching network SN. The embodiment shown in Fig. 10 employs two 4K byte buffers (11 and 12) to form a double-buffer arrangement in which when the buffer 11 (or 12) is accessed from the port side, the other buffer 12 (or 11) is utilized for a data transfer to or from the memory bank side. In this instance, it is controlled by switching selectors 11AS and 12AS on the address side and selectors 11SD and 12SD on the address side which of the buffers 11 and 12 is selected to be accessed from the port side or for the data transfer. For instance, when the memory buffer 11 is switched and connected by the selectors 11AS and 11SD so that it is accessed from above the port, the selectors 12AS and 12SD switch and connect the memory buffer 12 to the memory bank side. An address for the data transfer is composed of five low order bits A₀ to A₄ produced by frequency dividing the system clock φ with a counter DI₁, four higher order bits A₈ to A₅ produced by adding, by an adder ADD, the number of the port set by a switch PBS and the output of the switching network change-over counter (CNT), and three high order bits A₉ to A₁₁ produced by frequency dividing the system clock φ with a counter DI₂. Reference character PBC indicates a controller on the port side, PBPA a section for adding a parity bit to write data from the port side, and PBPC a parity check section for data read out of the memory bank side. The use of such a port buffer permits a page-by-page access from the port side independently of the connections by the switching network. For example, in the case of a write from above the port, the port buffer (11 or 12) in Fig. 10 calculates a write start address. As described previously with respect to Fig. 4, one page (4K bytes) is divided vertically into eight blocks, each of which is stored, by steps of 32 bytes, in the memory banks in the clockwise direction. For instance, in the case of writing from the port 4 when the value of the hexadecimal counter is a "0" in Table 1, the write starts at the memory bank MB₄ in Fig. 2. When the value of the counter is a "1", the write starts at the memory bank MB₅. That is, the port is connected to the memory bank MBi whose number is equal to the sum of the value of the counter and the number of the port. In consequence, data of the page to be stored is transferred, starting at an appropriate part thereof, from the port to the memory bank at which the write is started, that is, the data is written in the write start memory bank, starting at one block of the page, and then the write is effected in the succeeding memory banks one after another so that data at the bottom of the page is written in the last memory bank and data at the top of the first block of the page is written in the first memory bank (MB₀, for example). In this embodiment, the write start address for the page to be written is obtained by adding the value of the hexadecimal counter CNT and the address of the port, for example, a value 5 in the case of the port P₅. Accordingly, the write start address can be obtained simply by performing the above calculation in each port. The same method as mentioned above is employed for reading out data from the memory bank side. The readout starts at the memory bank MBi connected to the port, and when the read-out data is written in one of the buffers, for instance, 11, the number of the port and the value of the hexadecimal counter CNT is added by the adder ADD and the sum is used as the addresses A₅ to A₈ for accessing the buffer 11, whereby the data read out of the memory bank side is stored in the buffer 11, starting at the top of the page. Accordingly, it is easy to access the buffer 11 for reading out the data therefrom. According to the present invention, a page address is transferred by way of a data line and an address calculation is performed in each memory bank, by which it is possible to reduce the bus width which would otherwise introduce difficulties in packaging in a multiport memory system. The entire system can be made small and economical. Furthermore, a simple-structured switching network of little delay can be configured through utilization of bit-slice and PLA techniques. Moreover, by switching the connection between each port and each memory bank through the switching network to the next memory bank one by one, the address in the memory bank needs only to be transported to the next memory bank and the address need not be re-set upon each switching to the next bank, making it possible to provide a system which permits an efficient access to continuous areas. In addition, since the address transfer to the next memory bank and a memory access from the port can simultaneously be achieved independently of each other, data can be read out from and written in continuous areas without unduly increasing the access time therefor. Besides, according to the present invention, a buffer is provided between the switching network and each port and the port has an address calculating adder by which an in-page address, which is transferred to and from the switching network, is calculated from the sum of the value of a switching network change-over counter and the number of each port. This allows an access to start independently of the connections between the memory banks and the ports. The multiport memory system of the present invention, which has such features, can widely be used as a shared memory in a parallel processing system, and is very useful especially for a relational data base machine and a knowledge base machine in which the access unit is basically a page. A multiport memory system which has a plurality of data input/output ports, a plurality of memory banks, and a switching network for connecting each of the ports with one respective memory bank and in which pages are each stored across all the memory banks and an address is specified page by page from each input/output port, characterized in that the page address is transferred and set by way of a data line of the switching network and the address is calculated in each memory bank, and in that each memory bank has a shift register for rotating the switching of the switching network to transfer the page address between the memory banks in synchronization with the switching of the ports and for transporting the address to the next memory bank, a latch for fixing the page address during the shift operation of the shift register, and a counter for incrementing the page address by one during its transportation. A multiport memory system according to claim 1, characterized in that the switching network has a data transfer buse for each direction and the buses are bit-sliced and formed by programmable logic arrays and counters. A multiport memory system according to claim 1 or 2, which has a plurality of data input/output ports, each specifying an address page by page, a plurality of memory banks, and a switching network for rotating the switching of the connections between the ports and the memory banks, each memory bank having a shift register for transporting the address to the next memory bank, a latch for fixing the page address during the shift operation of the shift register, a counter for incrementing the page address one by one during the shift operation, and a counter for incrementing an address of a block by one upon each rotation of the switching of the connections between the ports and the memory banks, and in which the page address is transported between the memory banks in synchronization with the switching of the ports, the page is stored across all the memory banks, the page address is transferred and set by way of a data line of the switching network, and an address calculation is performed in each memory bank so that continuous data can be read out of and written in the same page from the plurality of ports, characterized in that a buffer is provided between the switching network and each port, the buffer has an address calculating adder for calculating an in-page address to be transferred to and from the switching network, from the sum of the value of a switching network change-over counter and the number of each port, whereby the access is started independently of the connections between the memory banks and the ports.